Break through the #1 obstacle between you and your dreams! Facing your fears is quite possibly the single most important work you can do for yourself, your families, and the world as a whole. The next step is to confidently walk through your fears. That is where the coaching and counsel of Stephen Edwards comes in. This program will help you consciously tap into your potential. It will give you more confidence and certainty in yourself and your abilities to deal with any situation. Break through the #1 obstacle between you and your dreams! Facing your fears is quite possibly the single most important work you can do for yourself, your families, and the world as a whole. The next step is to confidently walk through your fears. That is where the coaching and counsel of Stephen Edwards comes in. Most people simply allow their fear to paralyze them. When you make the decision to face your fear, you immediately feel the power. You instantly become more alive. Your senses are heightened. The world around you becomes more vibrant. And you become a greater person by far than you previously imagined yourself to be. You faced your fear and you took action. This program will help you consciously tap into your potential. It will give you more confidence and certainty in yourself and your abilities to deal with any situation. Your Miracle Life is intricately designed to help you realize, rediscover, and revitalize the greatness that is already within you. When you walk through your fears, you find that what lies on the other side is a deeper, more profound awareness, knowledge, and experience of who you really are and the unlimited potential that lies within us all. 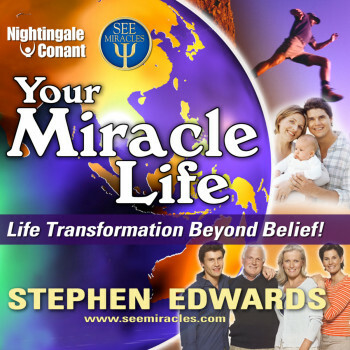 Stephen Edwards is rapidly becoming one of the most sought-after and highly respected speakers in the country today. His powerful, high-energy and dynamic events combine compelling cutting-edge strategies with accelerated learning technology and leave his audiences spellbound. Stephen has spoken to more than 2,000 companies and to audiences of more than 5,000 people throughout the United States. Specializing in communication, leadership, and self-empowerment skills, Stephen founded Stephen Edwards Enterprises, S.E.E. Originally from England, Stephen resides in Florida when he's not sharing his inspirational message with companies and organizations around the world.